Watch D.W. Griffith's Silent Masterpiece Intolerance Free Online -- It's the "Ulysses of the Cinema!" 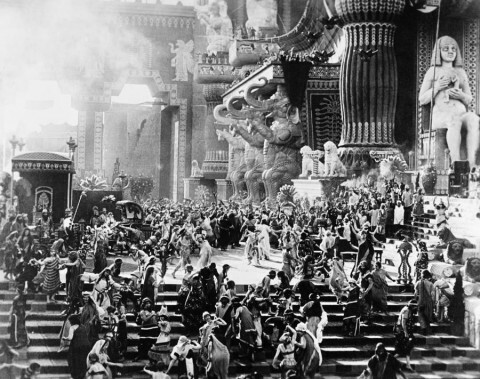 | Open Culture Watch D.W. Griffith's Silent Masterpiece Intolerance Free Online -- It's the "Ulysses of the Cinema!" In 1915, D.W. Griffith shot one of the most controversial films in the history of cinema. Birth of a Nation “was a decisively original work of art—in effect, the founding work of cinematic realism," writes Richard Brody in The New Yorker. But, despite being "titanically original," the film was outrageously racist in the way that it depicted African-Americans during the Reconstruction Era. Even in 1915, audiences knew that the film had crossed a line. The NAACP protested against the film's fabrications and inaccuracies. Riots broke out in Boston, Philadelphia and other major cities. And Griffith's legacy never recovered, even if he tried to atone (some say) in 1916 with the release of Intolerance, another masterpiece of the Silent Era. Billed as a "colossal spectacle," Intolerance featured massive sets, extravagant period costumes, and more than 3,000 extras, and, in grand fashion, it wove together "four distinct but parallel stories that demonstrated mankind's intolerance during four different ages in world history." A century later, Birth of a Nation might not get many public viewings. But this past weekend a restored version of Intolerance began a weeklong run at the Film Forum in New York City. If the restored version doesn't make it to a city near you, you can view the original film, all three epic hours of it, online for free. Intolerance is catalogued in our collection of 525 Free Movies Online. Very nice. Makes me glad when culture becomes available to everyone. Link not active on my iPad….